Furla SS2019 Women Collection is introducing its brand new monogram – linear, simple, elegant. In the style of the Italian House. The initial of the company name, of the founder's surname: a stylized "F", two graphemes that dovetail into a monogram. Like a heraldic coat of arms. A shield. Like the heraldic coats of arms of the most ancient Italian families. And like the ancient shields of the Italian cities. Furla Mimì, a new crossbody bag which provides the ground for creative experimentation and has already distinguished itself as one of the brand’s top creations - as part of its SS2019 collection. With the defining shape of its large, full body flap, it is available in two sizes: Small and Mini. Like every Furla bag, Furla Mimì also strives for innovative design, functionality and convertibility. The chain link strap, which ends with a leather insert, slides with the new system of rings on the top of the bag, allowing it to be worn both as a crossbody and as a shoulder bag. In addition, the flat pocket on the back of the Mimì bag provides a place to always have your essentials within reach, like your licence or mobile, without having to open the bag. Mimì has a grosgrain-lined interior, with a small open pocket. Furla Mimì comes in a range of ultra modern colours: bright Ruby red, yellow-green Lime, light orange Mandarin, and soft pink Camellia, plus two classics – Chalk white and black Onyx. The choice of materials is just as varied: Bouclé calfskin, Vacchetta leather (Furla’s sophisticated vegetable-tanned leather), Capra printed python and Mousse calf leather, smooth and studded. A new bucket bag extends the Furla family, beginning with the next SS2019 collection. Furla Corona, a bag with a clean design and a drawstring handle and closure, is distinguished by the new Furla monogram in metallic gold, imprinted on the body: the Shield. It is a mirrored F, joined at the bottom. A declaration of identity for a line that is a part of Furla’s cultural heritage, it has been reinterpreted in a contemporary way, with a more rounded silhouette and a particular variation of colours and materials. Furla Corona, in Small and Medium, comes in Bouclé calfskin leather in Dahlia rose, in Mousse calf leather with studs, and in Cocco printed calfskin as well as the summer versions that combine Straw and Fleu calf leather in Beige and Onyx, and Raffia and Denim in Blue and Onyx. They are pairings that highlight the double soul of Furla Corona - a bag both sporty and elegant, modern but very classic, not too large yet spacious inside. Furla Corona, in both sizes, includes a small detachable pochette with a zip closure inside, as well as a practical shoulder strap that may be attached or removed. Furla Brava, an eclectic and playful bag in the SS2019 collection is in the iconic shape of a camera case, available in three colours: Violet, red Kiss and Camellia rose, with a broad strap in jacquard ribbon.The camera case form makes it easy and practical to use, and it is incredibly roomy in both sizes: Small and Mini. Its design is simple and embellished by the monogram which stands out on the body. Naturally, the straps can be mixed and matched, besides those that go with each individual bag, with one of the many styles in the collection, including the most classic one – chain link metal and leather. 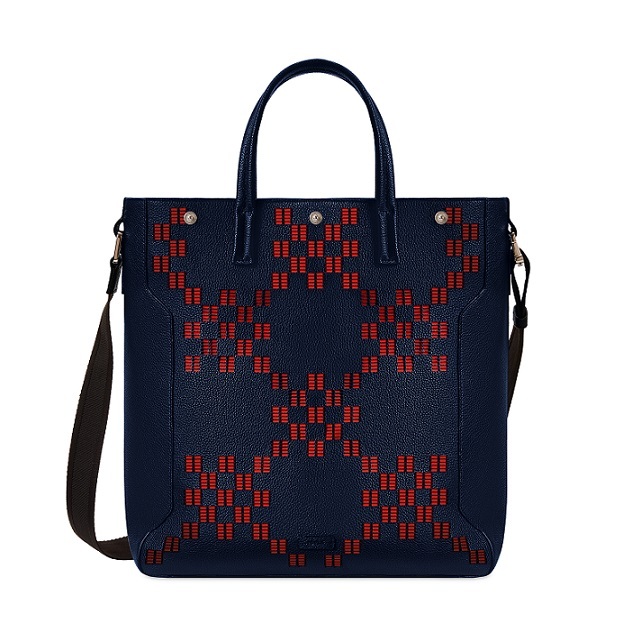 Furla Brava closes with a convenient zip and is lined in grosgrain, with a small hidden pocket. The SS2019 collection is the season of the Tote bag - the everyday bag, document and computer carrier, linear and practical. Furla proposes the new Furla Fortezza. The prominent, special feature is the design called the Furla Grid. It is an all over three-dimensional pattern made of raffia and lurex. On Furla Fortezza, we find the new monogram, as large as the body of the bag, which is made of Fleu calfskin leather. All of the variations of Furla Fortezza are extremely refined and showcase the tradition and the expertise of Italian craftsmanship. In addition to the mini square Furla Grid pattern, in fact, Furla Fortezza also comes in caramel-coloured Mousse calf leather, in straw, and in a combination of raffia and denim. It is available in two sizes, Medium and Large, as well as a Hobo version in Large. Furla Gioia is reimagined with a more contemporary and practical approach, as well as the perfect strap for the busy everyday routine. Easy to use, it closes on the top with a simple zip. It is enhanced by a mix of diverse materials that makes it elegantly sporty: the body is in Oasi calfskin, with a decorative central band in two-tone Suede featuring the metallic Furla Shield monogram, and a broad shoulder strap accentuated by a salt and pepper design. Furla Gioia comes in three colours - soft pink Dahlia, red Kiss and black Onyx - and in two sizes: Mini and Small. The belt bag has never been so cool and current. It is now being worn again, in many different ways, by the travelling woman - always on the go, sophisticated and smart. Its name is Furla Isola, and it is new to the Furla SS2019 collection. Furla Isola, which can be worn on the waist, on the shoulder, as a belt, or worn a bit low on the hips over a pair of jeans, is an accessory that stands out as the dominant feature of your look, yet is incredibly practical at the same time. Available in one size only, Small, and in two colours: Chalk white and Onyx. It is styled with metallic elements: the chain for attaching, the front zip and the Shield logo. You can choose from Bouclè calfskin, quilted or smooth Mousse calfskin, and printed Python. Furla Tortona is a celebration of beauty. Inspired by the minimalist style of the 90’s, Furla considers it the rebirth of the concepts of craftsmanship, elegance, and artisanal know-how. It is the latest expression of the brand’s iconic handbag, new for the Spring/Summer 2019 collection. Furla Tortona is a classic top handle trapezoid bag, with a triangle flap in quilted Mousse calfskin. It comes in Small, Medium and Mini. Furla Tortona has a detachable strap and a convenient outside pocket on the back of the body. The closure is marked by a smaller shield with enamelled details the same colour as the body of the bag. It is available in two ultra chic colours: soft pink Dahlia and dark blue, in addition to timeless black. For men, the Ulisse backpack returns in the SS2019 collection, with new silhouettes and materials, and as the head of an entire line that bears the same name, made up of everyday bags that are both practical and essential. The Ulisse backpack comes in St. Eracle calfskin, in floral print canvas, or in PVC coated canvas with the Furla Grid mini chequerboard design. Its unique inside out construction makes the stitching work invisible so that the backpack maintains a clean, sleek form. 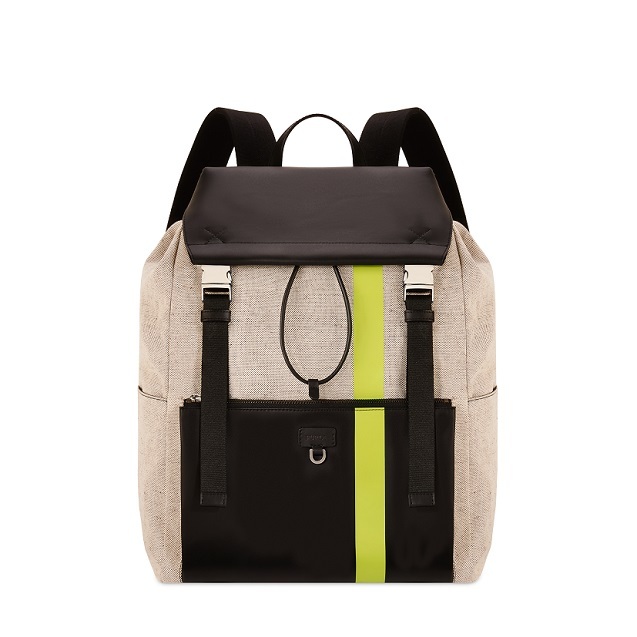 In addition to the curvy, zipper backpack, the rucksack with a flap - in St. Eracle calfskin and in canvas, featuring vertical, Lime-coloured thermo-welded trim – the slingpack, the crossbody bag and the tote bag are also part of the Ulisse line. The tote bag is an important aspect of the Furla man’s everyday life as well. Furla Giove, in a classic, trapezium shape, features handles that can be lengthened. 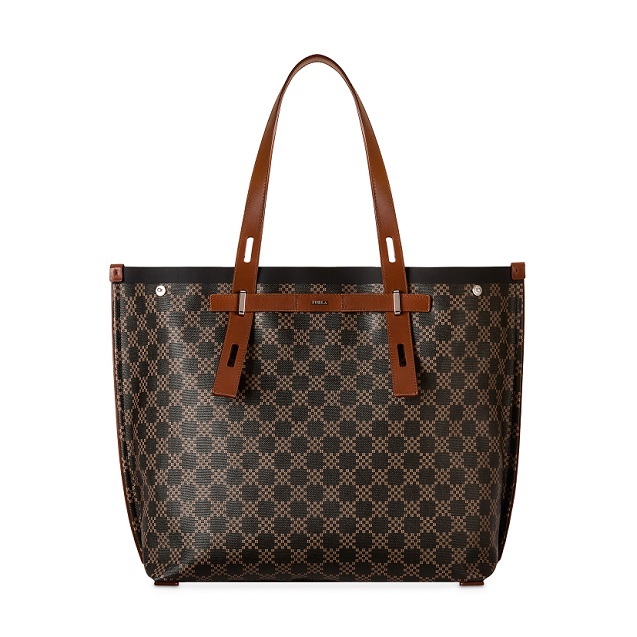 Furla Giove is offered in the widest range of materials: PVC coated canvas with the Furla Grid mini chequered print, floral print canvas, Nirvana Double leather, and Denim. Furla Giove’s unique feature lies in its unlined construction, which makes it light and extra soft. All of the bags in the Giove line, including the travel tote, the business tote and the clutch, have colour contrast interiors and a metal ring for attaching decorative charms. Furla Oceano, part of the SS2019 Men’s collection, is a bag whose soul identifies with an athletic, free spirit, inspired by sailing. Furla Oceano is a shopper bag made of double-faced Minilipari/Ares leather. The bag’s main characteristic is the removable internal lining: made from water-resistant fabric, it turns into an external cover for the bag thanks to the reversible button closure, playfully blending style and functionality. Light and summery, and fitting for any occasion, Furla Oceano comes in essential colours: blue, grey, or with the perforated Furla Grid pattern. The internal linings are red.